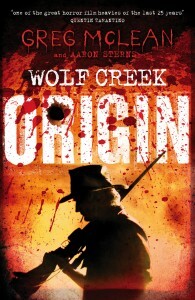 February is Wolf Creek Month – and what a way to start it off. I’m pleased to announce the official launch of Wolf Creek: Origin and Wolf Creek: Desolation Game on Saturday 1st February 4pm at Chuck McKenzie’s renowned genre bookshop Notions Unlimited (9/426 Nepean Highway, Chelsea – about an hour down the coast from Melbourne). I’ll be in attendance with DG author Brett McBean to sign, so we hope to see lots of people come along to grab some light reading material while waiting in line at WOLF CREEK 2. It’ll be sure to make everyone jealous.